Today we'll be overclocking AMD's Ryzen 3 2200G to the max with a $20 air cooler from DeepCool called the Gammaxx 200T. Now, you might be questioning the idea of splurging on an aftermarket cooler for a Raven Ridge APU that only costs $100 itself and already ships with the Wraith Stealth heatsink that is sufficient for mild overclocks. However, we've been keen to see how much more can be extracted from the APU when using an upgraded heatsink and whether that works out value-wise. Using the R3 2200G's stock cooler we were able to push its integrated Vega 8 GPU from 1.1GHz up to 1.6GHz, and while this lead to some nice gains, it also pushed operating temperatures well into the 80s and for this reason I wasn't able to overclock the CPU cores as well. If you're upgrading an old PC you'll require not only the 2200G, but also an AM4 motherboard, my preference being a decent B350 model, which typically cost around $70. There's a good chance you'll also need some DDR4 memory and decent dual channel DDR4-3000 8GB kits costs around $100. That pushes the total bill to around $270, which is an exceptional value considering it includes the reasonably capable Vega 8 GPU. Given that we saw a minimum of a 20% boost in games just from the GPU overclock, we've been dying to see the R3 2200G's performance with an even more aggressive overclock applied to the GPU, along with an overclock of the CPU cores as well. In the case of the DeepCool Gammaxx 200T and 300, for around $20 they increase the total build cost by just 7%. So if they can keep the Ryzen 3 2200G cool and quiet while allowing for gains of at least 20%, then it seems like you'd be getting a solid return on investment. If you're a new to overclocking or if you've just been on the fence because it sounds scary, I'd urge you to have a go. These days, it's safe and easy to get good results. Typically I encourage overclocking via the BIOS but AMD's Ryzen Master software actually works well and is much more friendly to beginners. If you're not sure where to begin, step one would be downloading and installing the Ryzen Master software. Once installed, open it and you'll be faced with the utility you see in our screenshots. It looks a bit overwhelming but relax, we can ignore most of this for our overclock. Click on the game mode tab at the bottom of the window, or alternatively you can use profile 1 or 2 if you want (which can be renamed by double clicking on them). Anyway, once you've selected one of these tabs you can start with either CPU or GPU overclocking. I suggest finding the maximum stable frequency of one part and then move on to the other. 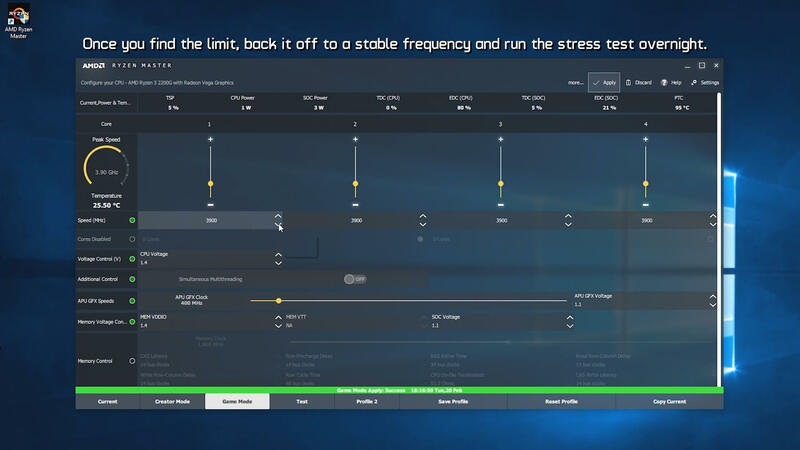 For the CPU, simply raise the frequency from 3500MHz to 3.7GHz, run a stress test like Prime95 or AIDA64 for about 30 minutes and that will give you a rough idea of how stable the system is. If it doesn't crash then proceed to 3.8GHz, run the stress test again and if your system passes like ours did the next step might be 3.9GHz. It's worth noting that you can do this in much smaller steps, I'm just impatient and prefer to make 100MHz leaps but you can move in 25MHz increments if desired. Most 2200G chips should be good for around 3.8 to 3.9GHz. While boosting the CPU's core frequency, you'll also want to increase the CPU voltage. That said, the Ryzen Master software defaults to 1.4 volts for some reason and this is already very high so I wouldn't recommend that you push this any further. In fact, you might be able to get away with dialing this down a bit, but somewhere between 1.3 and 1.4v is likely where you'll end up. Once the CPU overclock has been applied, you'll want to work out the maximum stable GPU frequency. By default, the Vega 8 GPU in the 2200G operates at 1.1GHz but the Ryzen Master software defaults to 400MHz, which is a ways off. Without any voltage adjustments you should be able to push this up to around 1.3GHz. To go higher, you'll need to increase the APU GFX voltage and the SOC voltage. By default, both are set at 1.1v. For the best results, I bumped the APU GFX voltage to 1.3v and the SOC voltage to 1.2v. The SOC voltage is particularly important as this is a single rail that feeds the uncore and graphics domains. I found that 1.2v was enough to stabilize the Vega 8 GPU at 1650MHz but I've seen reports of users going as high as 1.25v and this is the maximum voltage that AMD recommends. Free tools such as Superposition work well for stress testing your graphics overclock. With the GPU you can increase the frequency 1MHz at a time but you should be able to jump right up to 1300MHz and then continue from there with small adjustments to the voltage as you go. 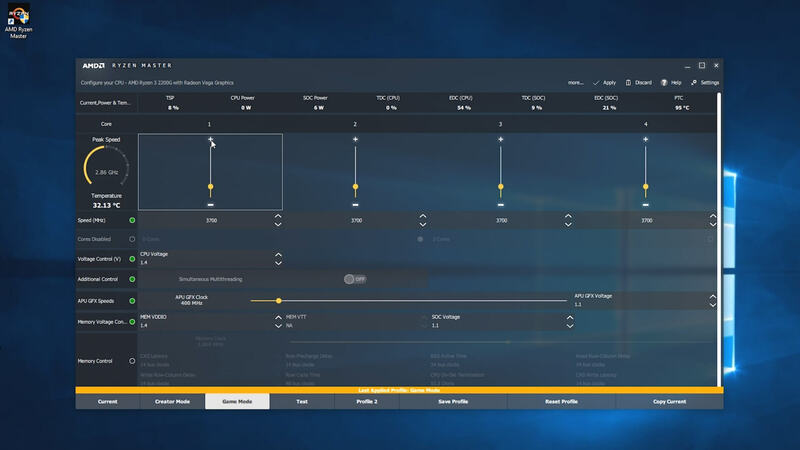 Once you have everything set up and saved to the profile of your choosing, you simply have to open the Ryzen Master software every time you start the system and apply the profile. Alternatively you can take note of all the settings and then apply them to the BIOS so they are loaded automatically every time the system boots. Whereas the Wraith Stealth was pushing into the high 80s with just the GPU overclocked, the Gammaxx 200T setup never saw temps rise above 55 degrees, which remarkable. Please note I maintained an ambient room temperature of 21 degrees. Not only that but the fan wasn't spinning particularly fast and I'd describe it as almost silent. That's pretty impressive given that we saw an average of 47fps with a minimum of 39fps and the frame time results were also respectable. 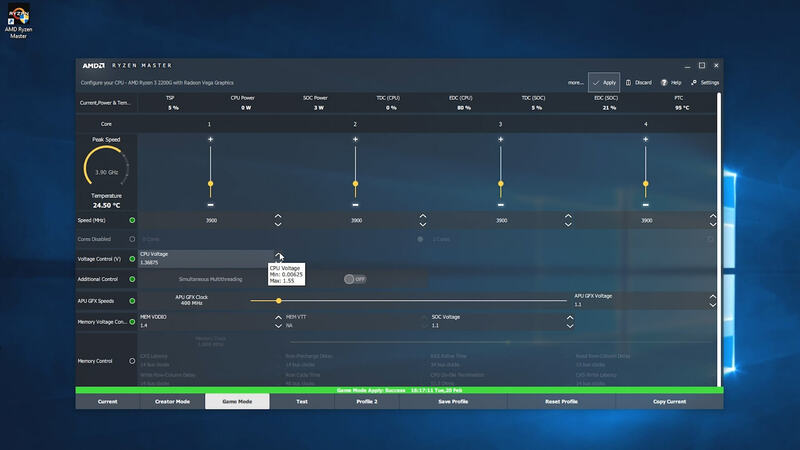 In fact, frame consistency was excellent in this title and while AMD does have its work cut out in other titles, it's great to have a few examples where the Raven Ridge APUs are silky smooth. Before moving on, I also ran an hour long Overwatch bot match. The way I configure this means that the game never actually ends so it makes for a great stress test. Temperatures again stayed under 55 degrees for both the CPU and GPU, and it was great to also see smooth performance in this title, which was set on medium quality at 1080p and 100% render scale. Since we just looked at Overwatch with our stress test, let's now check out the gameplay results. Here we see a 19% increase for the average frame rate and 23% for the minimum frame rate when overclocking the 2200G. That's a decent performance boost and it meant that the 2200G was not only faster than the stock 2400G but also quite a bit faster than the Pentium G4560 and GT 1030 when looking at the minimum results. Moving on to CS:GO we see a 22% increase for the average frame rate but a massive 45% boost to the minimum result. This is clearly a result of overclocking not just the GPU but also the CPU. Next we have DOTA 2 and here we see a 21% increase for the average but only a 13% increase for the minimum which is surprising. These are still decent gains nonetheless. The Fortnite Battle Royal results are interesting and not just because we see massive gains when overclocking. 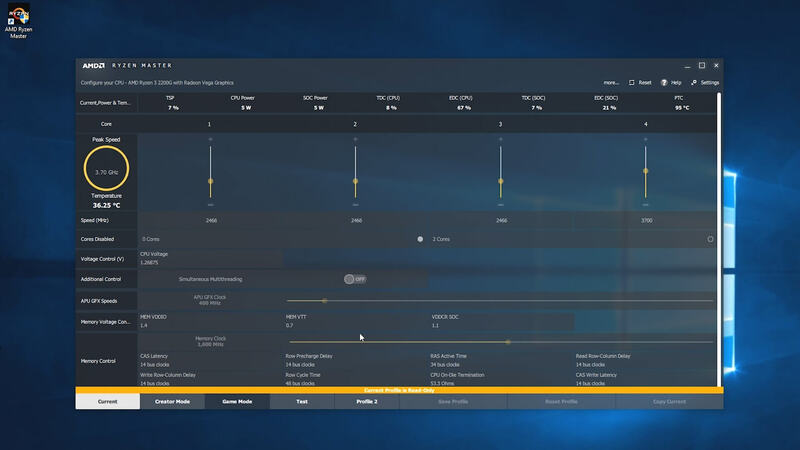 The stock 2200G seems somewhat constrained as the minimum and average frame rates are very close, much like what we see with the Intel CPUs and their horrible integrated graphics. 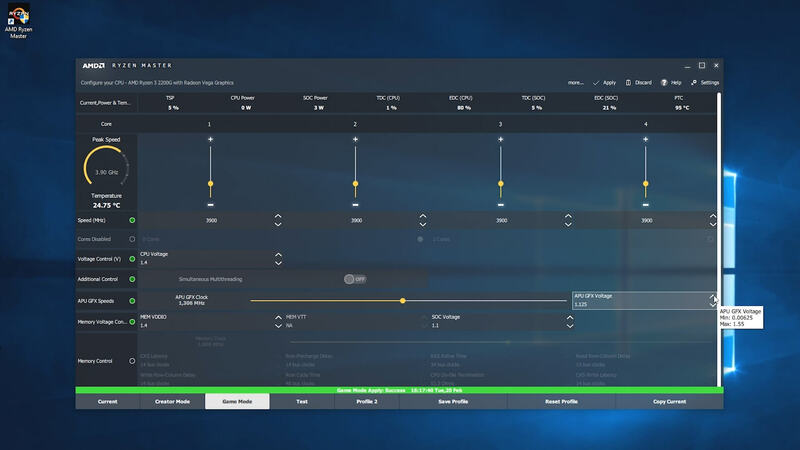 Overclocking the GPU seems to alleviate this issue and we see a massive 45% increase in average frame rate with a 34% boost to the minimum, allowing the 2200G to match the stock 2400G. Of course, I had to test PUBG, even though it's not a friend of the AMD APU. Overclocking still helped hugely here and that 25% boost was quite noticeable. Testing with Rainbow Six Siege saw a 21% boost to the average frame rate and a 25% increase for the minimum. So this is inline with what we’ve seen from most other titles. Finally we have Rocket League and here we see our worst result yet: a meager 16% boost once overclocked. Meager though it may be, it's not a bad result and ultimately allowed the 2200G to overtake the stock 2400G and almost catch the Pentium G4560 + GT 1030 combo. It's safe to say that a well overclocked Ryzen 3 2200G platform makes a strong case for itself at $300, which includes a budget aftermarket air cooler, a decent B350 motherboard and 8GB of DDR4-3000 RAM. By comparison, consider that the Core i3-8100 on a yet to be released B360 motherboard with 8GB of DDR4 memory and a GT 1030 will cost at least $370, so that twenty something percent savings will be most welcomed by budget shoppers. 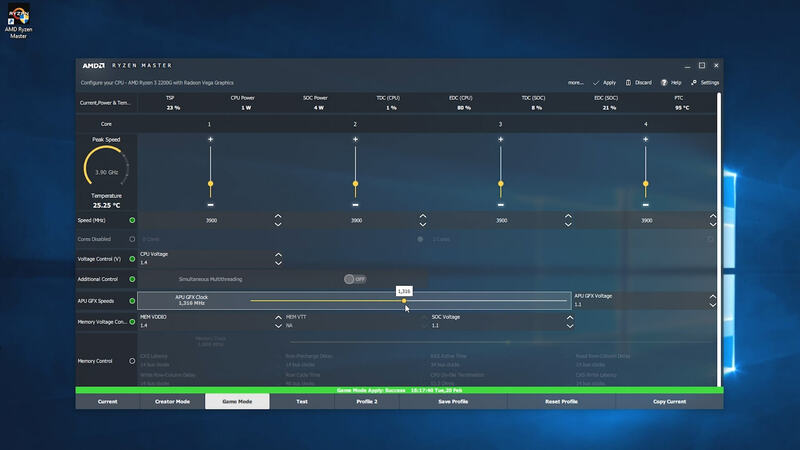 As a worst case scenario, you can expect to get around 10-15% more performance from this APU when upgrading to a basic aftermarket air cooler, so that seems worth the investment, not to mention that tinkering with these APUs is a heap of fun. In fact, I've found it more rewarding than playing around with the 8700K and a GTX 1080 Ti, though that's also a boat load of fun.